Do you ever wake up in the middle of the night, have a passing thought, go back to sleep? Well, my weird passing thought in the wee small hours overnight was I had not been to Baldwin’s Book Barn on Lenape Road in literally about 20 years! I am and always have been a bibliophile. A bookworm. A book hoarder. I love my books. They have moved with me thoughout my life. Even books from my childhood. Books from my parents. Cookbooks. History books. Gardening books. Fiction by Laura Ingalls Wilder to Daphne DuMaurier to Elizabeth Goudge to Marguerite de Angeli to Dickens to Robert Frost and the list goes on. I married another bibliophile. We love out books and they are all over the house in various bookshelves. Growing up I loved the book store at Bryn Mawr College known as The Owl. The college disbanded the beloved Owl years ago to make way for progress. There is still The Title Page in Bryn Mawr (which was started originally by ladies who were at The Owl), and that is amazing, but for those of us in Chetser County, and book nuts in general, there is nothing like Baldwin’s Book Barn. Nothing. And yes, when I popped awake in the middle of the night last night, my mind was on a big stone barn full of books…Baldwin’s Book Barn. What’s not to love? A giant Chester County stone barn built in 1822 filled to the rafters with books? Used books, out of print books, rare books, fun books, paperback books, bags of specially priced books….it’s book Nirvana…and it’s Chester County tradition. William and Lilla Baldwin established their used book and collectible business in 1934 in nearby Wilmington, DE. In 1946 they moved to “The Barn”. The old milking house was converted into a residence for the Baldwin Family and the stone barn became the bookshop and for some years, a country store museum. 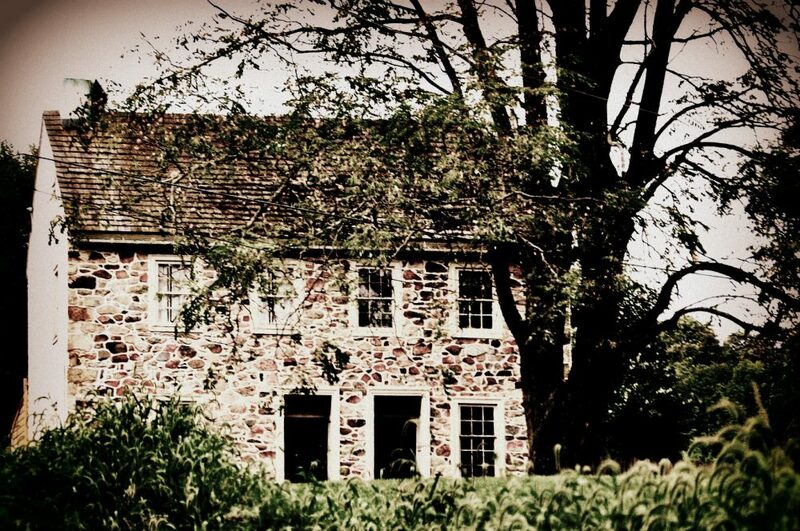 We are located deep in the heart of the enchanting and historical Brandywine Valley. Baldwin’s Book Barn is one of America’s truly distinctive bookstores. Step inside and you are transported to another time and place. Today, our store is stuffed to the rafters with a treasure trove of 300,000 used and rare books, manuscripts, maps as well as fine paintings, prints, estate antiques, and other valued collectibles. So when I woke up woke up this morning and my husband asked what else I would like to do today, I said “let’s go to Baldwin’s Book Barn.” So to the Book Barn we went. And it was like visiting a fondly remembered old friend. Ahhh the smell of books greets you still even with the door just cracked!!! And the door still creaked the same was going in. Still the same smell of woodstove fires. And still the same floor to ceiling books! I will note they still have a terrific Wyeth section and Chester County section. We went from bottom to top, top to bottom. I bought a couple of cookbooks. It is nice that some things remain the same in this life. I will note as an aside as I overheard this, that they could use firewood for their woodstove cut to 14″ or 15″ lengths if you can GIVE them any. There are enough woodstove folks in Chester County and so many people with firewood, how about paying it forward a little? Here are some photos I took. I will note with amusement that I never knew Paris Hilton wrote a book. I had a lovely time and won’t wait 20 years to go back. Go buy a book! This post has been surprisingly hard to write. I did not know what to call this post. “queen of shameless self-promotion needs dinner” was one thought. Re-titling the e-mail I am about to share “feed me” was another. “give her some figgy pudding…puleeaazze” almost made it. But then I just cringed because it occurred to me that although I have little respect for a certain Main Line area fauxblicist , I thought maybe she just didn’t know how she sounded. What am I speaking about? Quite frankly the strangest pitch I have ever seen anyone send out. It is worthy of a Saturday Night Live skit it is so awful. And I can’t take credit for ferreting this all out, I was sent it via a friend who knows Philadelphia Magazine writer Victor Fiorillo. Oh MY, aren’t you just embarrassed for Sarah Lockard? And wow talk about giving legitimate, hard-working publicists a bad name. How is it innovative to feed her entire family for free on Christmas Eve? And who goes out to dinner on Christmas Eve anyway that is Catholic or Christian? Unless your family member owns a restaurant? Don’t you gather with family and friends on Christmas Eve or go to church or both? How is this exciting? And who exactly is this exciting for precisely? Maybe for her because she is in essence asking for a free meal before services are provided. Sheesh I will Tweet and Instagram just because I like a restaurant. Heck we all do that these days. And Paris Hilton she ain’t…..but she does need a refresher course from Emily Post. Hey, here’s an *idea* – she can contact EmilyPost.com and ask if her whole family can get a refresher course on basic etiquette and Sarah will tweet about it, give 5 Instagram photos and so on and so forth? Sarah Lockard fashions herself to be a publisher, publicist, and social media wizard. She has had a website called AroundMainLine. I guess people use it, I never find much that I didn’t see someplace else and most of the content contains photos of Ms. Lockard herself. So maybe she is her own best client? Wonder what she charges herself? I will tell you straight up I am not a fan. People who try to climb so desperately and so obviously make me cringe, and well? To me this is trying too hard to belong. But then again this is quintessential Main Line of today, and why I don’t miss it. She likes to say she started Main Line Restaurant Week, which truthfully has less and less to do with the Main Line every year…the thing is this, it was another Sarah who is an actual publicist who did the original Main Line Restaurant Week years and years ago. I have never understood why she can’t acknowledge that. I have provided publicity for people as a publicist, and it is in essence what both of my parents did their entire professional career lives. I also have personal friends who are publicists. So I know how it is done. I get that Sarah Lockard obviously wants to feel good about herself. As women we all do. But to put out an e-mail like this in my humble opinion is akin to social / professional suicide. Except for the fact that the Main Line of today is not your mama’s Main Line. And this one does this unfortunately all of the time and never has the good graces to be the least bit embarrassed. So break out the figgy pudding y’all, Sarah wants you to buy her family Christmas Eve dinner. God bless us every one, yo’. 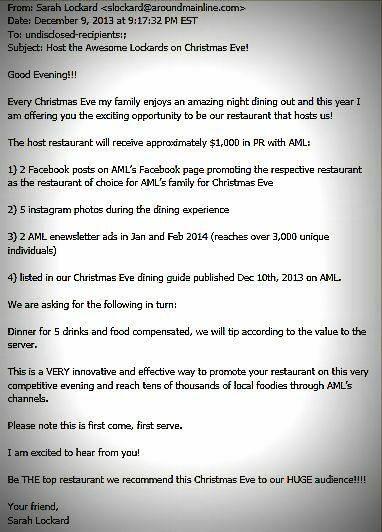 Restaurants of Philadelphia, sometimes just being a great restaurant isn’t enough to get publicity for your restaurant. In some cases, you need to buy a publisher and her whole family dinner on Christmas Eve.